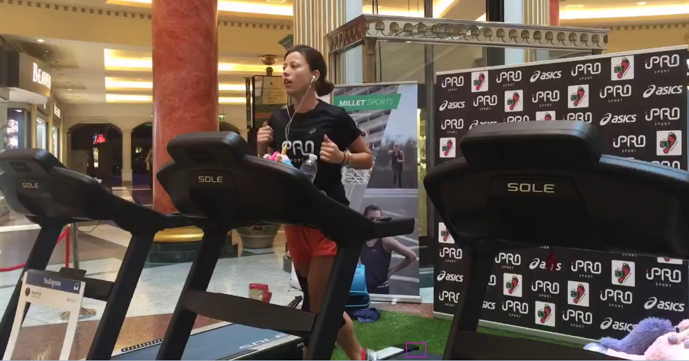 Amy Hughes’ record attempt spanned 7x24 hours from Sept. 1 – 8, 2016 at a shopping mall in the UK and was livestreamed on YouTube by sponsor Millet Sports. Amy Hughes and her boyfriend Dave Keighley have repeatedly claimed that there was livestream footage for all 24 hours of each day but despite many repeated requests, have not provided any footage for analysis. Several emails and tweets were also sent to Millet Sports to obtain the video but they have also not provided any links. The four YouTube livestream videos that are discussed in this summary were obtained by searching on Google and Facebook for people that posted about the hidden livestream links. The YouTube videos did not show any portion of the treadmill display that would allow for a check of the mileage claims. However, they do show a portion of the black treadmill belt rotating and it had a white “Sole” logo that appeared with each revolution. This is even better than video of a treadmill display because we can get a physical count of the number of revolutions of the belt that cannot be forged in the same way like written logs or changing the calibration settings. From looking at replacement parts for the Sole Fitness TT8 treadmill, we can see that the belt has a nominal length of 128 inches with a fully stretched length of 129.5 inches. For the purposes of this analysis, we will use a length of 130 inches to provide an extended margin of error. The program converts the detection area from the RGB color space to the HSV color space to allow for easier specification of the specific range of colors/intensities that we are looking for. By using the HSV color space, we are able to provide detection of the white Sole logo as well as the green grass in the top right corner of the detection area. This allows for a much more robust detection than simply using the gray-scale color space and using only intensity, which would not be able to reliably distinguish between the black/gray treadmill belt and the dark green grass. Each detected revolution of the treadmill belt is recorded as a separate line in the output file where possible, indicating the video time and video frame number. For durations greater than 5 seconds and less than or equal to 80 seconds where the program did not detect a belt revolution, it automatically inserts revolution counts using the average of the last 5 detected revolution durations that were equal to or under 5 seconds (corresponding to speeds of 1.477 mph or greater). In some cases, this could provide Amy Hughes with additional revolutions when she actually took a short break but it is deemed that this benefit would be small enough to not matter in the overall numbers. For durations greater than 80 seconds where no belt revolution was detected, it was recorded in the file output and I manually filtered for these exceptions using Excel so I could mark them as resuming from a break or input a calculated revolution count for cases where people stepped in front of the camera for some minutes. These occlusions happened when people like Dave Keighley or the physio stood beside the treadmill talking to Amy Hughes. The vast majority of the video footage do not have any occlusions. For the duration in the Sept. 6, 2016 video where the lights are turned off near the end of the video, I manually inserted the calculated treadmill belt revolutions by watching for the durations of the walking and running. The program also allows me to specify different coordinates for the detection area of the treadmill belt based on the video time so that if Dave Keighley moved the camera, I would be able to tell the program where to look. The spreadsheets should allow anyone to check my analysis since it contains the detailed breakdowns of each treadmill belt revolution detected and indicates the exact time and video frame number where it was detected as well as YouTube links that brings you to the time it occurred. The most important column of data for someone wishing to check the analysis results is the “Duration to Previous Detection (msec)” column. This column lists the time between the last detected treadmill belt revolution. For the data, you would expect that most of these durations to be between 500 msec and 5000 msec for a belt length of 130 inches. This corresponds to treadmill speeds between 14.8 mph to 1.477 mph. For the detections that occur after rest breaks/occlusions, this duration will be much higher. You can use the Data -> Filter ability of Excel to help you search for the data that interests you. Note that the total average speed for both of the 11h55m videos come out to very close numbers (3.45 mph and 3.46 mph). This is a good indication that the detailed video analysis is yielding valid results and that 3.45-3.46 mph is what Amy Hughes’ true ability is over a long duration. The other two videos with much shorter duration yield higher average speeds because they do not cover a long enough span. Also, we know from one of Amy Hughes Facebook videos and from one of her blog posts that she covered about 62.1 miles on the first day (Sept. 1st) with 18 hours of running. This works out to an average speed of 3.45 mph which essentially matches the total average speeds from the 12-hour videos above from Sept. 6th and 7th. This lends further support that Amy Hughes is really only capable of sustaining a 3.45 mph average speed over the long term. The overall total average speed for Amy Hughes given from the video analysis of the for available videos is 3.54 mph over a span of 28.77 hours. To provide an additional benefit of the doubt, we add another 2% to the mileage and average speed. This gives Amy Hughes a total overall average speed of 3.61 mph over 28.77 hours based on 103.9 miles covered. This average speed is skewed towards the high side since there are two short videos included in our analysis that wouldn't cover some of the activities we see in the longer videos. If we were to obtain all the live stream videos, I believe the total overall average speed would be much closer to 3.45 mph rather than 3.61 mph. From the above analysis, we found that Amy Hughes had a total overall average speed of 3.61 mph over 28.77 hours based on 103.9 miles covered. How does this compare with what is required to cover the 520/521 miles over 7 days that Amy Hughes and Dave Keighley claimed she did? We will use the lower 520 miles claim to provide a benefit of the doubt. Amy Hughes also claims in her interview that she was not on track to break the world record going into the 5th day of the run and then did several mysterious fast 5k/10k runs on the 5th and 6th nights out of nowhere that brought her ahead of the world record. This is very suspicious. From the detailed video analysis, there is no stoppage of walking/running in any of the 4 videos showing a 2-3 hour time span where Amy Hughes slept. In fact, the longest time span between the detection of a treadmill belt revolution in the videos is approximately 20 minutes. From this, we can see that Amy Hughes’ sleeping activities were carried out outside of what we can see in the video recordings. Additionally, if we were to assume she only rested for short periods in the videos and walked/ran/rested like that for 24 hours each day, she would be way ahead of even her claimed 520 miles based on the average speed of 3.61 mph. This 495.3 miles is significantly below Amy Hughes' claim of 520 miles (and also significantly below the current world record of about 517 miles) but would match up with what she has publicly claimed with losing time over the 1st to 5th days. The only way she could have reached 520 miles is if she indeed produced some “incredible” 5k/10k runs over the span of several hours on the 5th and 6th days like she claims. However, there is no evidence she did these feats and that claim is very suspicious for someone already very fatigued on a multi-day run. 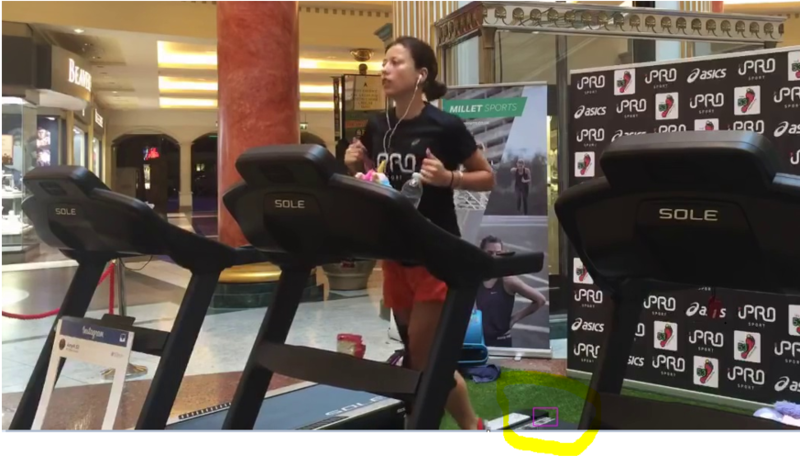 The calculated 495.3 miles is also assuming there is no other cheating going on since we can see in the Sept. 6, 2016 YouTube live stream that Amy Hughes did repeatedly lean/hung onto the treadmill bars while “running”. I would need Millet Sports to provide the rest of the live stream videos to verify what else happened. In summary, based on the detailed video analysis, I believe Amy Hughes’ and Dave Keighley’s claim that Amy Hughes covered 520 miles over 7 days on a treadmill is false and that she did not break the world record even if we ignore all the other problems with their attempt. The detailed video analysis suggests that Amy Hughes’ true mileage is around 495.3 miles in the absolute best case scenario and 473.6 miles as a much more realistic number, both of which have a significant amount of beneficial assumptions built in. This is pending verification that there are no other activities indicating cheating from the live stream videos that neither of them are willing to provide.